Join us on a 7-night, supported and guided journey, cycling - with a little walking - all the way from Rwanda’s capital, Kigali, to Lake Kivu in the north-west of the country. We will wind through tea, banana plantations and volcanic lakes as we climb towards the Virunga Mountains - a chain of volcanoes that are home to some of the world’s only remaining mountain gorillas. From there it's west along the chain to Kivu, one of Africa's Great Lakes. Along the way we’ll cycle through villages perched on hillsides, visit some inspiring community projects and get to know parts of Rwanda that very few visitors ever visit. Affectionately named the ‘Land of a Thousand Hills,’ Rwanda doesn’t do ‘flat’ meaning there is plenty of up- and downhill, affording incredible views around every corner. Join our founder Oli Broom on a 7-night, supported and guided journey, cycling - with a little walking - all the way from Rwanda’s capital, Kigali, to Lake Kivu in the north-west of the country. We will wind through tea, banana plantations and volcanic lakes as we climb towards the Virunga Mountains - a chain of volcanoes that are home to some of the world’s only remaining mountain gorillas. From there it's west along the chain to Kivu, one of Africa's Great Lakes. Along the way we’ll cycle through villages perched on hillsides, visit some inspiring community projects and get to know parts of Rwanda that very few visitors ever visit. 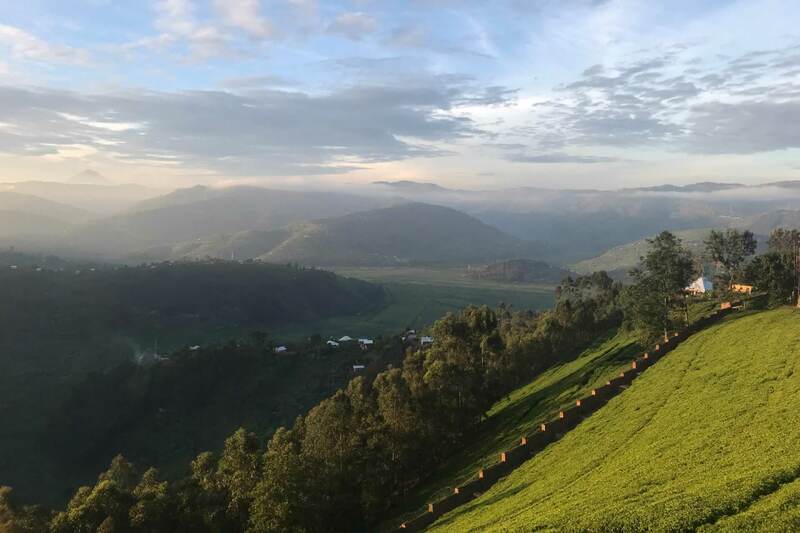 Affectionately named the ‘Land of a Thousand Hills,’ Rwanda doesn’t do ‘flat’ meaning there is plenty of up- and downhill, affording incredible views around every corner.